The Fat-tailed Dwarf Lemur, also known as Lesser Dwarf Lemur, is endemic to Madagascar. 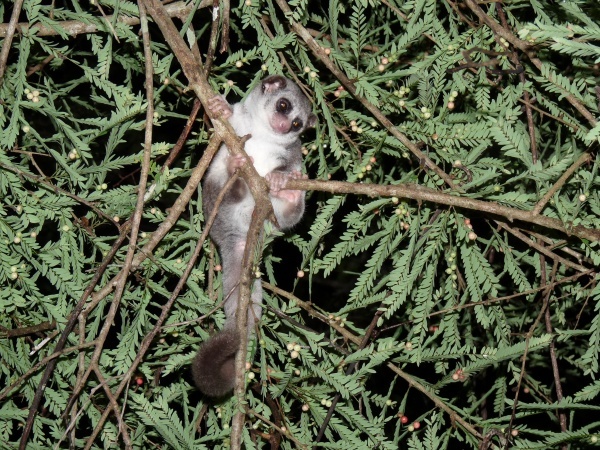 The Western Fat-tailed Dwarf Lemur (Cheirogaleus medius) lives in the dry forest in the west of the island. The Southern Fat-tailed Dwarf Lemur (Cheirogaleus adipicaudatus) can be found in the moist evergreen forest of southeastern Madagascar. Equal in size to a small rat, the Fat-tailed Dwarf Lemur is one of the smallest primates. The body length is about 20-23cm and the tail measures 20-27cm. Depending on the season, the body weight varies between 120g and 270g. This nocturnal lemur has huge eyes with black rings around. The fur is brownish-red or grey, with a complete white underbelly and white feet. The Fat-tailed Dwarf Lemur spends almost all the time in trees and moves by jumping with all four short legs. Its eating habits include mainly fruit, but also flowers, seeds, insects and nectar. From time to time small vertebrates are on the menu. Throughout the tropical but dry and hot Malagasy winter, the Fat-tailed Dwarf Lemur hibernates in tree holes for six months. During this time the lemur lives from fat stored in its tail until the coming of the next wet season. Unlike other hibernating animals, the Fat-tailed Dwarf Lemur is not able to control its body temperature, which therefore varies according to the outside temperature. The Fat-tailed Dwarf Lemur lives in small groups. Its mating period is the end of November, shortly after the winter sleep. After about 61 days the female gives birth to one to four offsprings, although twins are very common. The fossa, Madagascar harrier-hawk, Madagascar buzzard as well as the Madagascar ground boa and Madagascar tree boa are predators of the Fat-tailed Dwarf Lemur. This page was last modified on 26 May 2016, at 16:24.